University students and recent grads can have their essays reviewed anonymously by an academic panel that includes a Nobel Laureate. BusinessBecause interviewed Daniel Garraty, co-founder of Project Firefly,to learn more about this new independent platform launched to promote the next generation of thought leaders. The platform is for university students and recent graduates, and gives them an opportunity to develop their ideas on key global challenges. Daniel explained that Project Firefly is an idea that he and Professor Evenett bounced back and forth during his MBA at the University of St. Gallen. Although they both had great visions for it, they never imagined it would take off so quickly or attract such high levels of web traffic from places like Kathmandu! They've kicked off with Credit Suisse as Founding Sponsor and within four weeks of their launch, they’ve had over 12, 000 unique visits with high levels of traffic coming from both industrialised and developing nations. Daniel and Prof. Evenett can check "international outreach" of their "To Do" list. They’ve received registered profiles from over 206 universities worldwide including students and graduates from such diverse locations as the West Indies, the US, Iran, the Philippines and Rwanda. Daniel graduated from the St. Gallen MBA programme in 2010 and his full-time job is implementing everything he learned from his MBA to run Project Firefly. “It really challenges your skills right across the board, everything from cutting edge social media marketing to making key strategy decisions”, he says. 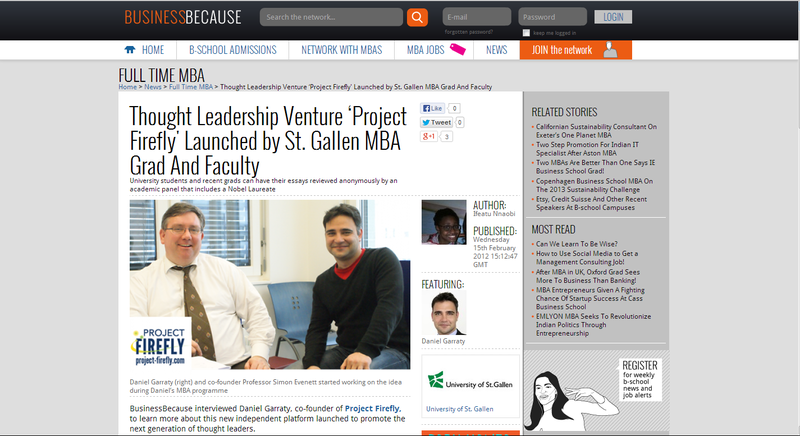 On the St. Gallen MBA, Daniel collaborated with colleagues and worked closely with Professor Simon Evenett on ideas that eventually led to what Project Firefly is today. To Daniel, Project Firefly is "about giving people the space to demonstrate their abilities and develop themselves". He emphasizes that Project Firefly embodies the notion of the energy generated through collaboration between individuals. Furthermore, it’s a way for potential future leaders to have their opinions heard and recognized today. One unique feature of Project Firefly is that members can submit essays that will be reviewed anonymously by academics. The review board includes faculty from Harvard University, London School of Economics, UC Berkeley, Sydney Business School, Seoul National University and the University of St. Gallen, amongst others. What student wouldn't jump at the opportunity to have their essay reviewed by a board that includes a Nobel laureate and a former first Deputy Managing Director of the IMF? Currently, Project Firefly has an ‘Emerging Leaders’ essay competition sponsored by Credit Suisse. The authors of the best essays will be invited to attend a premier Credit Suisse thought leadership conference in Hong Kong, all expenses paid. There is also a first prize of 3,500 Swiss Francs and a dozen other cash prizes. Born to Burmese and English parents, Daniel grew up in Vancouver, Canada and in the UK. He gained his undergraduate degree in Cultural Studies from the University of Portsmouth in 2003 and worked in financial services before setting up and running his own real estate business for nearly seven years. Daniel knew he wanted to live in Switzerland so being on the St. Gallen MBA was a great opportunity for him to integrate into the Swiss system. He saw the MBA as a chance to earn the right academic validations and to take his skills as an entrepreneur to the next level. In future, Daniel and Professor Evenett intend to feature more essay competitions covering a wider variety of topics. They also plan on boosting the website’s capacity for networking and creating an environment that caters to career development. I need some advice on whether to apply for an MBA at St.Gallen or not?I have gone through your posts and the useful insight you have provided on St.Gallen.However,my pre-MBA situation is similar to yours as I am looking to move into IB(in particular Sales and Trading) with GS,UBS etc...The problem is that my background is Telecommunications and although I have experience trading markets part time for last 3 years,I am not sure what my chances are of making a switch into IB with current economic climate? To be honest,I had not heard about St.Gallen until I received an email from the Market and Admissions Manager who found my profile using GMAC's online tool GMASS.Even though my GMAT is 650 ,he encouraged me to apply to the MBA program.Upon researching I have found that it is a good option provided you want to settle down in Switzerland.Can you provide some stats on the number of people going into Investment banking directly from Campus?or how easy it is to work in switzrland (work permit) after an MBA? I am an Indian telecom engineer and have been working in UK for the past 6 years.I dont have any knowledge of German.Please let me know what you think about the aforementioned points.